Yes that's right, I just said introduction because most of us in India are probably new to this topic. Who is the most successful manager of EPL? How many times has Brazil won the World Cup? The most expensive transfer so far? If you follow football even half of what I follow, you would know the answers. Now, the next round of this quiz. Don't mentally answer it, say it out loud. Make yourself proud. Who was the most successful coach for the Indian National team? How many times has India played in a World Cup? Which club has won the most number of I-Leagues? You see a thousand people wearing a Messi jersey but never a dude posing in Bhaichung Bhutia jersey.You keep track of the number of titles European teams have but you don't know who the last I-League winner was. And we say that Indian football is no fun. How can a sport excel without the support of its countrymen? Take for example- cricket; it took off on a bigger scale after 1983. Are we waiting for something like that to happen in football? India won in 1983 with eight nations competing. Well, in football you got 204 nations competing just to qualify for the World Cup. There are things about Indian football that you should just be knowing as a football fan; inexcusable to be unaware of these facts! This tournament, named after its founder Sir Mortimer Durand has been played in India since 1888; making it the third oldest competition in the world. Football leagues were played in India even before Real Madrid or FIFA existed. It was initially started as a competition for the Army- British as well as Indian but later it became an open affair for public teams too. Even today there is army presence in the competition. Army XI last won it in 2005. The Indian Army deserves a lot of credit for keeping this competition alive. 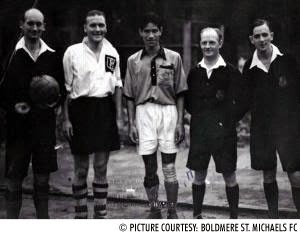 65 years ago at the London Olympics an independent Indian national football team took on France in the first round of the Olympic football competition. The Indians put on a brave display to win the hearts of the spectators. For 70 minutes the score stood at NIL all. Had the Indians not missed the two penalties, the French would've faced a major heartbreak who ultimately won it 2-1. What highlighted the match other then India's fighting spirit was the fact that most of the Indian players were either barefoot or just wearing socks! India has qualified for a World Cup; never played in one. The qualification came as a result of the withdrawal of the other Asian countries. And why India withdrew later has a lot of disputed answers. One being that India couldn't afford the trip to Brazil, lack of match practice, team selection issues and the ridiculous one being that we withdrew coz barefoot playing wasn't allowed. "We had no idea about the World Cup then. Had we been better informed, we would have taken the initiative ourselves. For us, the Olympics was everything.. There was nothing bigger"
India won the 1951 Asian Games which they hosted. In 1952, later, India also won the Colombo Qradrangular Cup held in Sri Lanka. The winning streak continued with India winning the cup again in 1954, 1954 and 1955 which were held in Burma, Calcutta and Dhaka respectively. 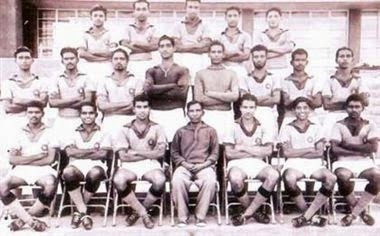 The Indian national team ended up as runners up at the 1954 Asian Games. 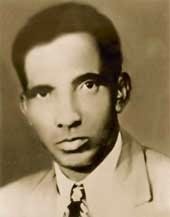 One of the greatest achievements of Indian football was finishing 4th at the 1956 Olympics with the Indian striker Neville D'souza ending up as joint-highest goalscorer who also became the first Asian to score a hattrick in the Olympics and also making India the first Asian team to reach the Olympics semis in the process. India went on to win the 1962 Asian games and two years later finished second in 1964 Asia Cup. India played in the Merdeka Cup in 1964, 1965 and 1966 where they finshed 2nd, 3rd and again 3rd respectively. Who is Syed Abdul Rahim? The man responsible for the ^Golden era of Indian football, pioneer of modern football and the most successful Indian football coach- Syed Abdul Rahim. He is the "Special One" of Indian football. He had the eye to spot talent and make them shine. He was the coach from 1950 till his death in 1963 due to cancer. He would observe day-to-day things, movements of monkeys and drew inputs from them to formulate his game plans. - One of the forwards who played under him in the 1950s, Balaram. Unfortunately, he is an unsung, forgotten hero today. We need to give it a thought!! well written, sorry read it soo late!! Hmm i like that you have not shied away from being descriptive here...a loyal fan of the sport u r....Your rotaract club of Dahisar Coast is ready to support you if you come up with some scheme to better the awareness regarding football in India [or just Dahisar for that matter]. Cricket - A Gentleman's game? Not anymore.